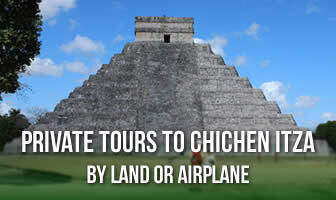 Merida, Palenque, Tulum, Chetumal, Xcalac, Mahaual, Campeche, Chichen Itza. Cessna 208 12 passengers, day trip. Going an the returning the same date. 1.- All reservations are made by e-mail and paid for in advance, at the time of receiving confirmation of a reservation. For our customers' security sake, we do not accept reservations over the phone. We do not accept sending in credit card information by e-mail and neither do we make any charges to credit cards by telephone. 2.- In the smaller hotels, reservations are subject to availability and are handled as follows: The customer sends in an availability request; our site confirms it and authorizes payment made with credit card or a bank deposit at a later date. 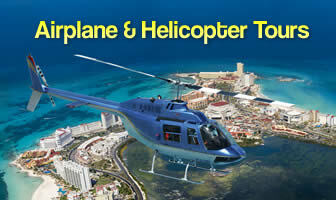 3.- Once payment has been made, mexicancaribbean.com will e-mail the customer a reservation voucher. 4.- At the time of making the reservation, the customer assumes to have seen the pictures of the hotel or tour he/she is choosing and have read the information thereto. In the case of hotels in Holbox and Tulum, the customer is aware that many of these hotels are rustic with the services indicated in our site. 5.- Rates may vary with no prior notice, but if a reservation has been made, the price paid will be unchanged. 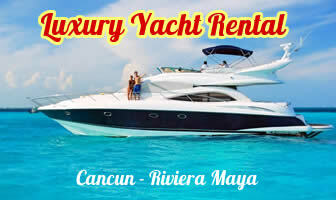 6.- All our rates include tax and are per couple. If additional persons are coming, the customer will be informed of the extra charges according to the hotel reserved. 7.- All reservations must be made at least, 3 days in advance. No reservations will be admitted later than this. 8.- Cancellation refunds will be made as follows: If the client cancels 30 days or more prior to the guest's arrival, a 80% refund will be made. If cancellation is made between 29 days and 8 days prior to arrival, refund will be 75%. If cancellation is made between 7 and 3 days prior to arrival, refund will be 50%. 10.- Refunds will be made to the Paypal account used to pay for the reservation, within a term of 7 days after receiving the cancellation. 11.- Only written cancellations, e-mailed in, will be accepted. No telephone cancellations please. 12.- Should the hotel be unable to offer the room reserved by the customer due to a hotel failure or to acts of God, like a hurricane, the customer then will be entitled to a 100% refund. The customer may also opt to be lodged at another similar category hotel if he wants.